we are home safe, and I've only just gotten back online. Grr to dial up! We had a good drive home, and managed to get everything in, after a slight panic attack when I saw the mounds of stuff that was meant for the baby's room! It's been so hot in Toowoomba, up to 36 pretty much every day since we've been home! Luckily not too humid though. Still uncomfortable. Baby checkup went well on Monday, BP good, heartbeat strong, and I'm 1/5th engaged!! So things are on the move, which is really good. I'm getting a little antsy, itching to cuddle my baby. 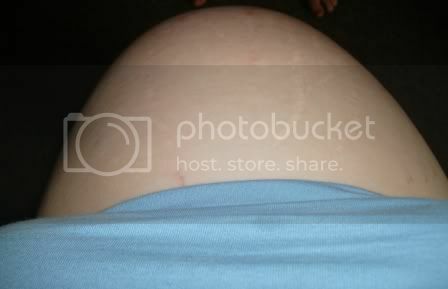 Here are some pics I took today - 38 weeks. And what I see! See how bub is sitting to the left?? Felt so weird today.